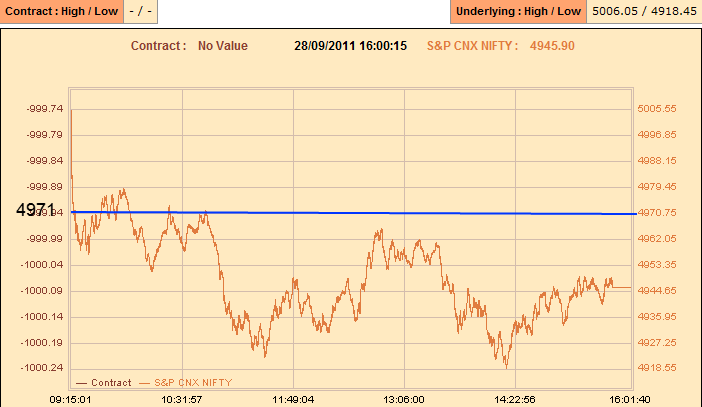 Is it going to be a neutral expiry around 4946 levels for the September series ?! The penultimate session of the september series saw markets trading below the previous close of 4971 after a very strong up move on the day before. Throughout the series there were varied expectation of Nifty breaking out of 5200 levels as well as correcting much below 4700 levels. But more or less Nifty was confined within that range. Today being the expiry day of September series, the view is that markets can remain in a tight range of 60 points in and around 4946 levels (between 4916 and 4976) levels before closing for the series around 4946 levels. 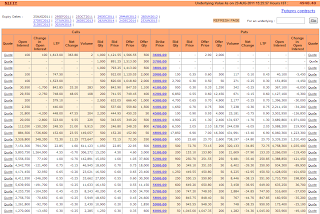 Options data saw 10 lakhs increase in both 4800 puts and 4900 calls and there were wide spread activity in all out of the money strikes for the series. 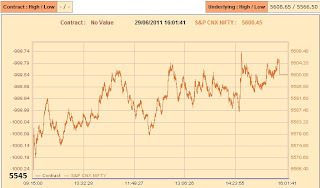 Throughout the series the implied volatility of calls were very less when compared to that of puts…(calls were being traded around 25 and puts around 37) and this was prompting for an upmove from the bottom level, though the expected breakout on the upperside when Nifty was near to 5150 levels did not happen inspite of the volatility of calls being very low. 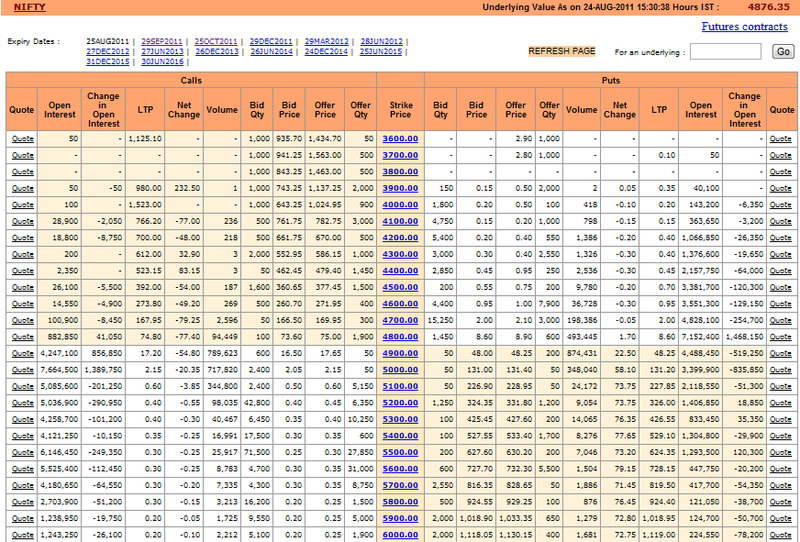 Similarly the open interest in puts at times were huge when compared to the near strike OTM calls. 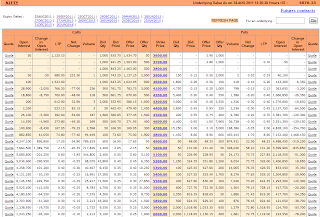 It is better to trade in ITM calls and puts for the day, i.e buy 4900 calls when Nifty trades near to the bottom range of 4916 levels and trade in 5000 puts when Nifty trades near to the higher range of 4976…The combined premium of 4900 puts and 5000 calls at end of the day was around 25 and it is not expected that any one of these options will trade higher than the value of 25…If that happens then markets might go for a breakout in that particular direction and might reach 5050 or 4950 levels, though it is currently assumed to be of lesser probability. 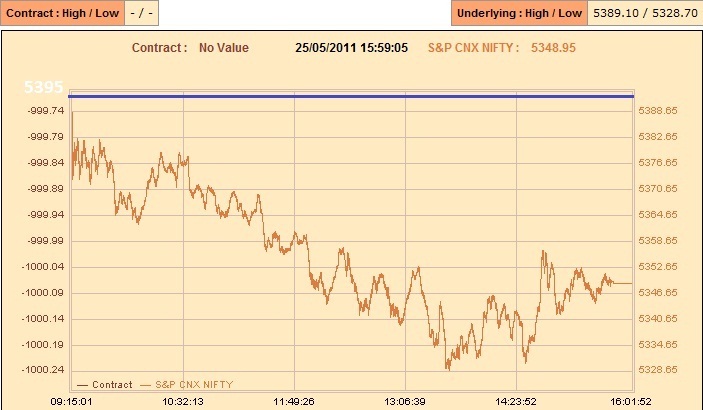 Is nifty heading to a close near 4800 levels for August expiry ?! Yesterday markets saw a break down of 4900 levels and also closed below that. Throughout the series bears were able to pull back nifty from any small bounce and it is expected that bears will take control for the expiry also and push nifty for a close around 4804 levels today. The important ceiling to watch out for today is 4927 level and it is not expected that the markets will go above that level in the initial half of trade, the hard ceiling being 4941. We are entering into the expiry day of May series and throughout this series right from day one, it has been bears maintaining the upperhand. Throughout the series PCR has remained below 1 and also made a low of 0.75 levels signalling a strong bearish bias. On the expiry day the expectation is that Nifty will break the 5300 barrier and go for a test of 5284 levels before closing near to 5300 levels. A neutral day to end the March series closer to 5800 levels ?! Nifty reached 5800 levels yesterday and then closed a shade below that level at 5788. 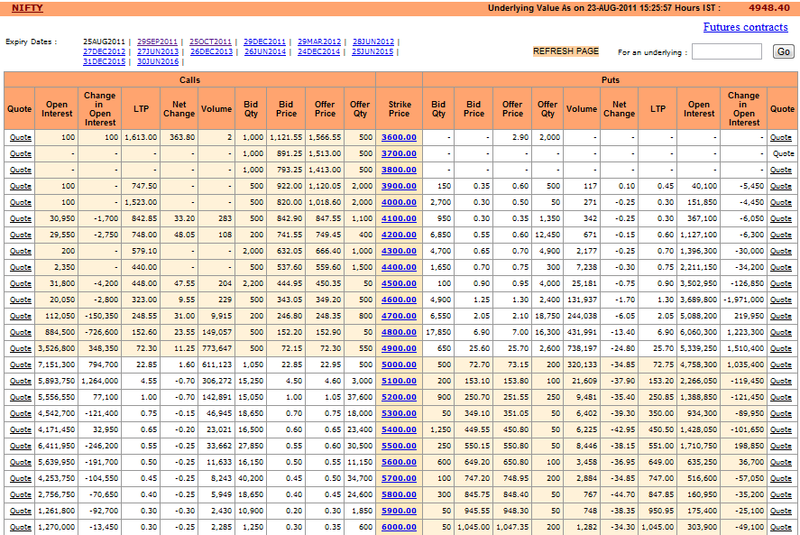 The OI increase was seen in 5800 puts as well as 5900 calls. PCR is at 1.11. Today being the expiry day of the series and the last session of the financial year, it is likely that markets will hover in a range of 5754 to 5832 before settling for a close near to 5800 levels. 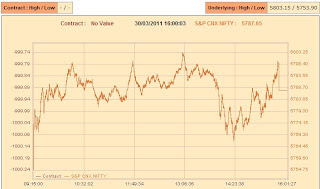 Nifty is continuing the bullish streak which started on 22nd March and after breaking the key level of 5558 with a powerful gap up opening on friday, bulls completely took control and were able to push markets towards the 200 DMA levels of 5691 after testing above 5700 levels for the first time in two months. There are 3 more trading sessions for the close of the financial year as well as the expiry of this series and it looks like there could be a close near to 5750 levels for the series. Inspite of Nifty being in premium, bulls have managed to push markets to higher levels from the low of 5233 for the series. The expectation in the next three sessions is that market may not dip below 5622 levels and might be hovering in a close range for the next two sessions, before bulls take charge again for expiry and push it towards 5750 levels. Yesterday again 5985 levels proved to be a strong resistance and bears took complete control from there on and pushed Nifty towards the low of the series around 5826. Overall markets have opened strong for the day and is hovering near to 5900 levels. Strong resistance exists at 5934 and it is unlikely for markets to break the barrier for the day. On the bottom side, 5864 is providing support. So it is likely that markets will hover between the levels of 5864 and 5934 for most of the day before bearishness sets in. There might be a final bearish move for the day, with ONGC correcting significantly. For a week the bearish move towards 6000 levels was written and the possibility suggested was that the move was to happen on the expiry day. Bears could do so one session earlier and pushed markets below 6000 levels to further test the support of 5985 and close the day above 6000 levels. Options data saw huge increase in the OI of 6100 calls as well as 6000 puts and the PCR stays at 0.99 which is giving a neutral indication. The expiry day can either stay neutral around 6009 levels or bears can further push markets down to test 5937 levels and also settle for a 5954 close. The possibility of Nifty testing higher levels looks very remote and might face strong resistance around 6032 level itself for the day.